There may be more than 20,000 iPhone apps out there that have been downloaded more than 500 million times, but what is the average shelf life of each app? Greg Yardley, CEO of Pinch Media, offers some stats based on the 30 million+ downloads his iPhone app analytics startup has kept tabs on. One of the most telling slides in a recent presentation he gave shows the drop-off rate in iPhone app usage (see above; entire slide presentation embedded below). For free applications, only about 20 percent of users return to use the app the first day after they download it, and then it quickly drops off from there. By 30 days out, less than 5 percent are using the app. The chart for paid apps shows a slightly steeper fall-off rate. So there is a very brief window of time to capture people’s attention and potential revenues. The key insight of the presentation is derived from this data. Because it answers the eternal question that all iPhone developers have: Should my app be free or should I charge for it? For all but the most successful apps, the free route does not make much sense because ther eis not enough time to recoup the costs of developing the app from advertising. Free apps tend to be run 6.6 times more often than paid apps, but even with that increased usage, it is not enough to make more money. Yardley offers some quick math. The average paid app returns $0.70/user. 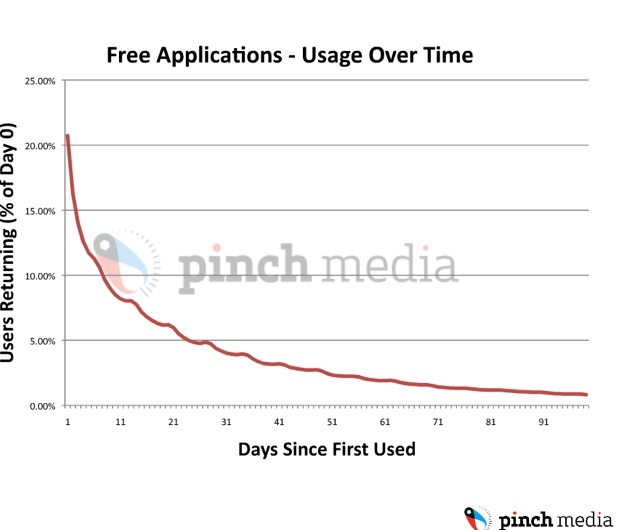 The average free app is run 80 sessions. In order to earn the same as a paid app on a per user basis, the free app would have to command an $8.75 CPM (cost per thousand ad impressions). But most iPhone app ad rates are in the $0.50 to $2.00 range. That is assuming on ad per session. The other option is to bombard users with more ads, which might scare them away.